Q. Who is Mr. Smarty Plants? A: There are those who suspect Wildflower Center volunteers are the culpable and capable culprits. Yet, others think staff members play some, albeit small, role. You can torture us with your plant questions, but we will never reveal the Green Guru's secret identity. 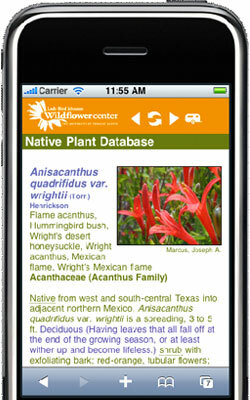 Did you know you can access the Native Plant Information Network with your web-enabled smartphone? Ask Mr. Smarty Plants is a free service provided by the staff and volunteers at the Lady Bird Johnson Wildflower Center. Please forgive us, but Mr. Smarty Plants has been overwhelmed by a flood of mail and must take a break for awhile to catch up. We hope to be accepting new questions again soon. Thank you! Need help with plant identification, visit the plant identification page. Title: What does the seed for Tiquilia greggii look like? What does the seed for Tiquilia greggii look like? Do you have a picture? Tiquilia greggii (Plumed crinklemat) has two synonyms—Ptilocalyx greggii and Coldenia greggii. On the USDA Plants Database you can see (under its synonym, Coldenia greggii) a closeup of the inflorescence with the plumes that are attached to the tiny fruit (with its seed) . Here is a link to photos from Southwest Environmental Information Network. "The seeds are about 2 mm, sort of elongate-ovoid and pointed at the ends. They are dark in color—brownish black with a light colored longitudinal band or stripe. They are not attached to styles, but are inside the calyx, which has rather plume like lobes. You kind of have to dig around in each tiny flower to pop the seed out, or rub the whole flower head gently over a screen. You can plant them without getting the seeds out, though, if you just break apart the head and broadcast the whole shebang in a tray of medium." September 24, 2011 - Do you know anyone who has Abutilon Fruticosum (Indian Mallow) seeds for sale? I would love to grow the Indian Mallow, but can't locate a source. Thanks! Support the Wildflower Center by Donating Online or Becoming a Member today.